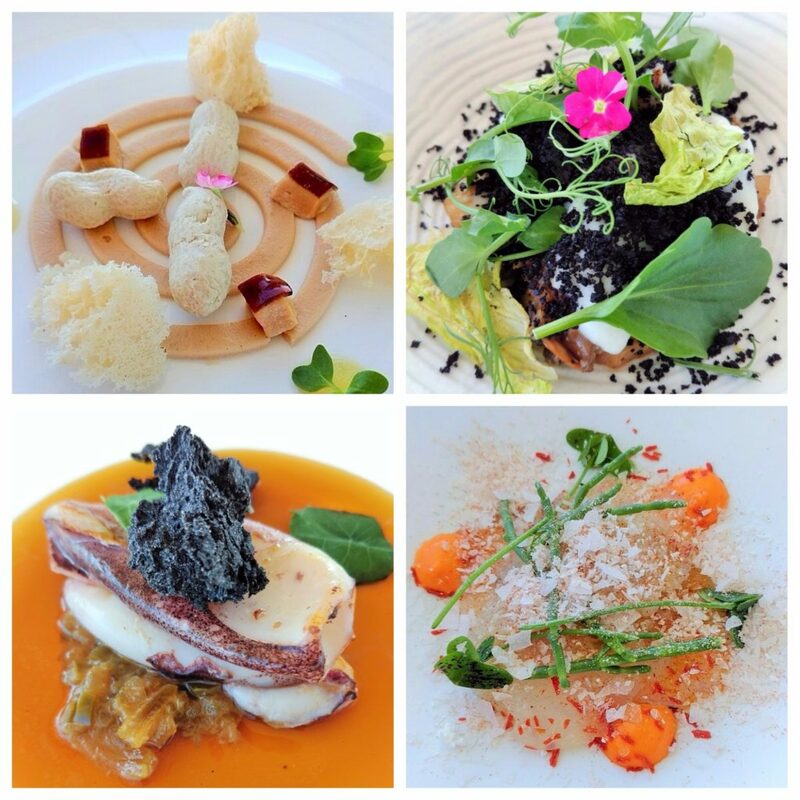 For any serious foodie coming to Granada a visit to Restaurante Arriaga is certainly a 5-star tasting experience. 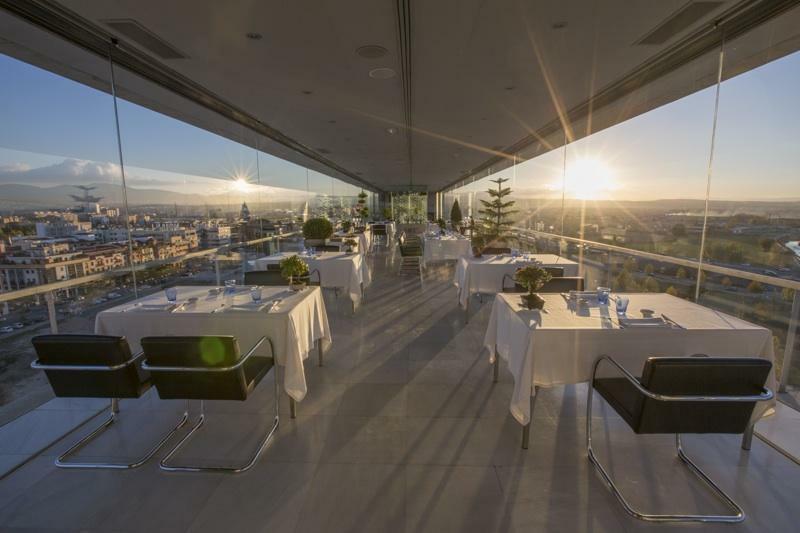 The restaurant itself boasts unprecedented views of Granada and the Sierra Nevada mountains because of its location, 55 metres up, at the top of the museum building La Memoria de Andalucía (opposite the Science Park). Run by Basque born chef, Álvaro Arriaga, the restaurant oozes elegant, simple, clean decoration and sets high standards of culinary excellence in the city. There are 2 tasting menu options: El Camino (The Way – 9 courses) or Medio Camino (Half Way – 5 courses). We went all out and chose the 9-course one as well as the 3-glass wine pairing option. 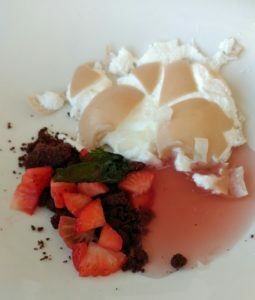 It was always going to be an amazing experience and the food definitely did not disappoint. A real 5-star tasting menu treat! The courses played with the senses and your sense of humour! Great effort is made to use local produce, of the highest quality, whenever possible. 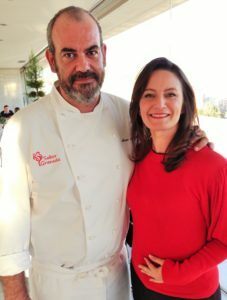 The menu overall is not extensive but that´s the way Chef Arriaga wants it. (Lower right) Monkfish ceviche with sundried tomato mayonnaise, clover shoots and crunchy (not salty! ), flaked sea salt. The main dessert was pure entertainment (see link to Facebook post for video). What you see is (not) what you get! The plates arrived and the food was “smashed” right in front of our eyes. Chef Arriaga came out to greet us and spoke about the concept of the food he creates which was a real surprise and treat to meet the man himself. All round it was a 5-star experience. 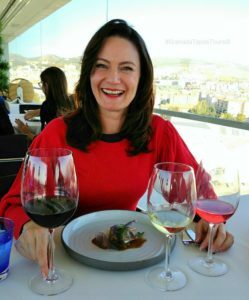 While you´re in Granada don´t miss out, book a Granada Tapas Tour food experience and make sure you book a meal at Restaurante Arriaga as well!